I found this article very informative and I thank you for that. From reading this I was getting the feeling you believe PLM is ahead of BIM. For the record I do not disagree nor do I agree. I am still trying to understand the difference or at least the origins of the two as they seem to be on a collision path. I know PLM has been around longer than BIM (at least this is my understanding) but it does not necessarily mean BIM should/will follow the same path as PLM. They can endup at the same destination with taking a different road. I am definitely more involved with organizations which are implementing, or at least trying to implement PLM efficiently and it always seems there are more disasters (a slight exaggeration) than there are successes. From the little that I do hear about BIM, I hear much more successes than failures. From the “BIM” projects I have heard they do not only focus on the 3D model but also the data to give the 3D model life (time, cost, etc.). They definitely seem to focus more on data than process but could this simpler model compared to PLM be why they can be successful? The Airbus DMU sounds much more like BIM(more Data-centric) vs. PLM(more process-centric). Thanks for the great post again it really got me more confused (which is a good thing). Denis – first of all thanks for sharing your confusion. For me, it demonstrates I did not make my point clear enough. To answer your points: Yes I think PLM is ahead of BIM when it comes to historical experience. As you have noticed implementing PLM seems to lead to difficulties, which I think must appear when you implement PLM. The reason: PLM forces a company to work in a different manner. It is not a tool that you install and connect to the users. I have written several posts about the relation between PLM and business change, so I won’t repeat it here. BIM is currently in the stage of discovery of collaboration. Meaning no high expectations yet, however, not touching the real complexity of data sharing yet either. From reports about BIM trials, I learned that there are many issues still about classification and standardization of data. All goes well if you stay within one vendor´s suite of products. In a multi-vendor / multi-discipline environment, it is not mature yet. We know from other industries you cannot force partners and suppliers to work with a single vendor suite, although the vendor might dream about that – see automotive and aerospace experiences. To conclude, as I do not want to write a blog post in this comment. BIM should learn from lessons learned from PLM. Old PLM has the same symptoms as BIM – people connecting applications with a lot of enthusiasm, I think they should focus on sharing data on an information backbone (a PLM infrastructure) and connect and use the applications that work on that infrastructure. Currently BIM has no infrastructure only interfaces defined. I hope this clarified a little, and I will keep the topic on the agenda for a future update. Thanks Tom – agree there is much to talk as the topic is not so easy as it looks like. Happy New Year ! Hello Jos, nice surprise to see your blog on BIM-PLM. I have been active in this area since, some 10 years ago, I got involved in the post-master Architectural Design Management Systems (ADMS) program at Eindhoven University of Technology. In parallel to my academic PLM activities, I teach BIM principles and coach BIM related graduation projects in AEC companies in the Netherlands, Belgium, Germany and Austria. From this background I like to give some comments on you blog. The first publication on BIM seems to be from 1992, while the first EDM applications came to the market around 1987. Although being roughly the same age, my experience is that PLM is far more developed than BIM. A video like the Airbus one as you show in your blog (which I immediately forwarded to some BIM-colleagues, because it shows so splendidly the PLM idea), could not be made from any past or current BIM based construction project. I have seen some reports on successful BIM cases in prestigious buildings like museums and theaters where complex shapes could only be realized using 3D modeling. When looking at BIM software offerings, Autodesk Revit is currently dominating the market. 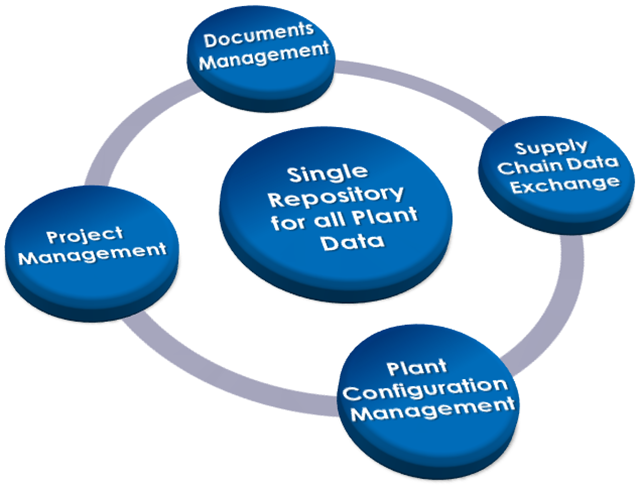 However, comparing its functionality to a high-end PLM system, it offers mainly shared 3D-modelling, but I have not yet found significant support for version and status management, work flow, BOM management etc. that are essential in PLM. Also their PLM360 cloud offering is merely a document management system. In our projects on BIM introduction I have found more reluctance and resistance than enthusiasm. Where BIM software has been applied, it was not integrated in the process, but used as a kind of parallel activity to maintain a model on basis of traditional documentation delivered by the participating parties. It appears to be very difficult to force all parties to work directly in the shared model. One obvious reason for slower acceptation is there are no global players the size of automotive and aerospace industry that can afford large investments in software and that can enforce the use of standards on partners in the chain. 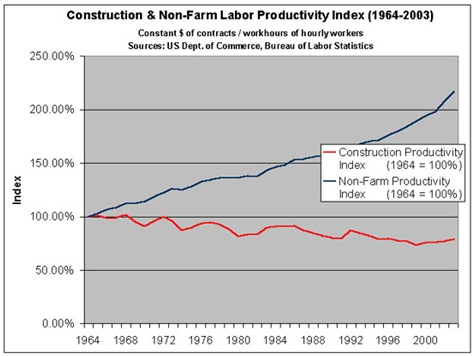 However, an even stronger factor is the lack of a real drive for productivity improvement. One cause is the lack of global competition in AEC, but more important is that a building is not regarded as a cost, but as a real estate investment. This means that the cost of building does not matter, as long as it meets the expected market value. Thus even the customer, the future owner of the building, has no real interest in lower prices. Even stronger: a large part of the building stock is owned by a rather small group of real estate investors. Lowering construction cost would cause a decrease of value of their current stock, so they have a strong interest in obstructing any real BIM initiative. Of course they will not say so openly, so what you see is many BIM demonstration projects with public funding, which result in symposia that report great success, but do not result in real adoption of BIM practices. An evident effect is that it is very difficult to explain the value of BIM to the construction partners. Each partner traditionally is paid a percentage of the total building sum. If you propose to reduce cost with 5% they regard this as a 5% reduction of their income. This means that BIM will only work in new contracting models. BIM could develop successfully in areas where real estate value is not relevant for the owner, like in hospitals, schools, government buildings and infrastructure projects like roads and bridges. A new hospital (Meander, Amersfoort, the Netherlands) recently has been developed with integral use of BIM to an extent where even the final delivery inspections where performed on basis of the digital 3D-BIM model. The architect reported substantial savings on failure cost. Another interesting development is that today government requires the application of Systems Engineering (SE) in bids for large construction projects. 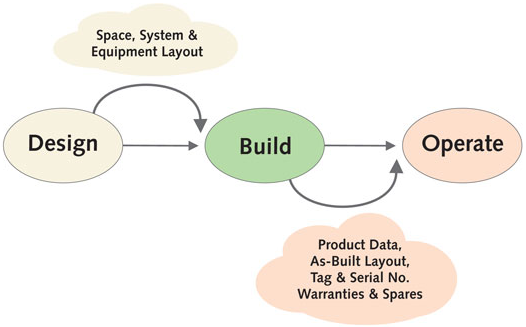 The motive is to realize traceability of requirements, but there is also the effect that SE requires explicit engineering process definitions which in a next step can be used to integrate BIM in the process in order to realize further cost and lead time reduction. Concluding I believe in BIM as an important development, which is very similar, but lagging behind to PLM. BIM can learn from PLM, but also PLM can learn from BIM, because of the strongly dispersed structure of the AEC industry. I am looking forward to continuation of this discussion. thank you very much for these remarkable remarks. I think your analysis of the market is spot on. 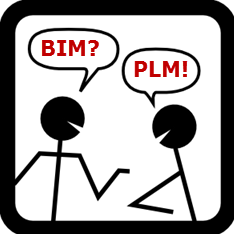 May I suggest to rename BIM to PLM-AEC just to avoid an unnecessary and none winner strife between PLM and BIM which doesn’t make any sense at all? The AEC-market has a lot to gain if they would use lessons learned within the Aerospace and Automotive Industry over the last 40 years. They seem to cruise on ‘learning by doing’ their own AEC way but are not sufficient aware of developments like Odette of VDA (Vereinigte Deutsche Automobilindustrie) in Germany where the complete German Automotive Industry exchange their data on that one platform correctly for probably 30 years or longer already. Of course AEC is different to Aerospace and Automotive but there are many corresponding aspects to learn from like DMU (Digital Mock Up). Which AEC-company is willing to reduce failure costs in order to perform World Class? The AEC market is usually complaining their margins but a value adding focus on their Design, Engineering, Procurement and Construction processes has not yet taken off due to reasons you mentioned. Hopefully this will change soon. Which company will globally be the first? Arabtec? Because of the huge development programmes within UAE like Abu Dhabi 2030 or somewhere else? Great information. This is becoming the best post on BIM and PLM I have read. Even stronger: a large part of the building stock is owned by a rather small group of real estate investors. Lowering construction cost would cause a decrease of value of their current stock, so they have a strong interest in obstructing any real BIM initiative. This political and financial obstacles are very interesting and very real. As with any technology, solution or strategy there always seems to have these obstacles. To be aware of them is very important. I believe BIM has been mandated for a couple of new, large infrastructure projects in the UK – Crossrail being one of them. What depth of BIM that will drive out remains to be seen – I can see the architects using it as they have been CAD literate for many years (Laing O’Rourke, Arup etc) but how far down into the ‘feet on the ground’ sub-contractors it goes is a different question. I persued PLM for construction several years ago and one objection raised was the single-project nature of these organisations – a project team comes together for maybe 1-3 years and then separates. There aren’t the long-term projects/organisations that the defence/auto companies have so the ROI is much more difficult. Obviously big infrastructure programmes do have the longevity and the ongoing operation is borne by the same people (government) so perhaps they’ll ‘see the light’ and drag the AEC industry into the 21st Century as regards data management. Thanks for your feedback and you bring in an interesting point that I have experienced too. Where the value of a BIM infrastructure should be benificial for all projects, most of the big construction companies focus their data management activities per project, and build their teams per project. Usually because data management is budgetted per project based on the customer requirements – this blocks a general change and improvement process in these companies. Jos, this is a great article and you have really done a great job by talking about both domains in a great amount of details. I have been exposed to BIM during some of my engagements, and I think there are some fundamental differences between BIM and PLM. One such difference is BOM management. It is a continuous and evolving process in PLM when it comes to keeping all the three BOMs ( EBOM, MBOM, and SBOM) in sync whereas I am not sure if BIM cares for managing such synchronization as a continuous process. In PLM, it is always about product development and innovation whereas in BIM, it is more about project management and execution. Thanks Dilip for your feedback. I think it is crucial in the information transfer to add another structure which connects all the BOM. In plant and process engineering this is often called the functional structure or logical structure, defining the system view of the plant (could be building). As the functional structure usally does not change during the lifecycle, this is the placeholder to connect all. Great post and great comparison. I also enjoyed the comments. Thanks a lot. The similarities of PLM and BIM are so fundamental that if we can develop a system with flexible data-model/ back-end and also a front-end divided in several layers (and modules), we have even the possibility to use the solution in both environments. It needs however news way of seeing data-models and new approaches by integrating modern technologies like semantic web technologies. With the same back-end logic, we can offer various front-ends for different groups with different needs! P.S. : These are not just some fancy ideas. I ‘m writing a dissertation in this topic! Yousef hello, Thanks for your feedback – i fully agree we have to look at it from a different way to manage data models (different from classical PLM). It is for sure an area to write a dissertation. Keep us informed. It is a while since I started my research in this area and hopefully soon a paper will be out about the proposed concept and the achievements (this summer). You will for sure get a copy of it and I would highly appreciate your precious feedback. If you find it appropriate, you may also write in your blog about it. If you are writing a thesis on BIM/PLM, I am very much interested, so if you would like me to comment on your work, I would be happy to do so. Thank you for your interest in my dissertation and research area. I would be for sure more than happy to have your comment on my dissertation and work. -and third “considering multi-layer front-end framework”. This three issues help to convert a PLM to an XLM (x can be anything!). It means, my research is not exactly related to BIM, but as a case study it can be used to test the hypotheses and show its strengths and weakness. Therefor I would appreciate, if we can discuss the topic as my research progress. As soon as my concept tests and analysis is done, I will contact you. First you will receive the papers and then we can have some conversations via Skype or better I will drive to your office in the beautiful city Eindhoven. We are just 97 km away from each other ;). P.S. : I will write you an email, so that you have also my email address. My Google+ profile is also available. Joe, great article. The biggest issue i believe is the fact that you highlighted in the article. Who owns the data backbone. The actual project is only around for 3 years or so, maybe longer for a major infrastructure project like cross rail. But the actual asset is around for many years. So why would the construction company fork out on a large infrastructure to populate the data. This would be a great opportunity for a Saas application, as the cost of ownership can be passed to different entities during the buildings lifecycle. Another issue with PLM is that they have the wrong terminologies and the stakeholders don’t get it as they don’t use the PLM nomenclature. Thanks Colin – fully agree with your comments. Question remains who wants to own the data in the future? A service company ? Indeed a very interesting conversation. I’m surprised IFC has not been mentioned at any stage of this exchange ! To my understanding IFC is likely to play a significant role in the potential success of BIM as it allows construction partners to build a building DMU without using the same BIM tool. What BIM & IFC do not currently permit is the management of all the exchanges taking place during a construction project (access rights, versions, modifications, validation workflow, …); this is where PLM or simplified PLM can bring real value. wow there is so much to say on this topic but , like many others here this is a great collection of the current thinking. I have worked in PLM and more recently BIM for the last 15 years in the Shipbuilding industry Aerospace and Automotive and most recently construction/AEC and agree that conceptually PLM and BIM are trying to achieve the same things, but as one of the readers commented they have come at the problem from different angles due to the way the industries work. However this is harder to achieve in the AEC/Plant industries due to the vary major contractual boundaries, not just in the project phase but into the operational phase. For this reason BIM has focused on processes and end goals, regardless of the software and tools that support the individual players processes. In my experience with PLM (mostly Dassault and Siemens) it was more of a fight to simply get everything into one massive database. The current thinking from Jos and Oleg seems to support a more federated approach where information standards, class libraries and workflows need to be centrally managed but the actual data itself can be mastered in any appropriate authoring application. Which seems to support the imminent use of a SaaS approach to the problem. One other major consideration that has not been mentioned here, but is a favourite of my shipbuilding peers (Denis) is the way that the end product/project is put together. In the manufacturing industries the production line is created to build a product . i.e.. an assembly line. In shipbuilding there is a fixed manufacturing facility but it needs to manufacture a variety of essentially unique products, and in the AEC world there is a different site each time, and maybe a variety of unique manufacturing facilities for each project./site. Therefore things get really interesting in BIM/PLM not at the engineering /design stage but in the construction and manufacturing phase. A similar parallel can be drawn when looking at the operational phase of products as compared to assets. Although we all know these is a lot of cross industry rubbernecking going on. Thanks David for your insights, pointing to some more differences between the PLM and BIM practices due to different business. You might have read my recent post which was a follow up on this one: 2014 The Year the construction industry did not discover PLM. Some more experiences in that post added.